MITArchA hosted a reception for SA+P Dean Hashim Sarkis on March 18, 2019, and Bay Area alumni gave Dean Sarkis a warm welcome on his first visit to San Francisco. 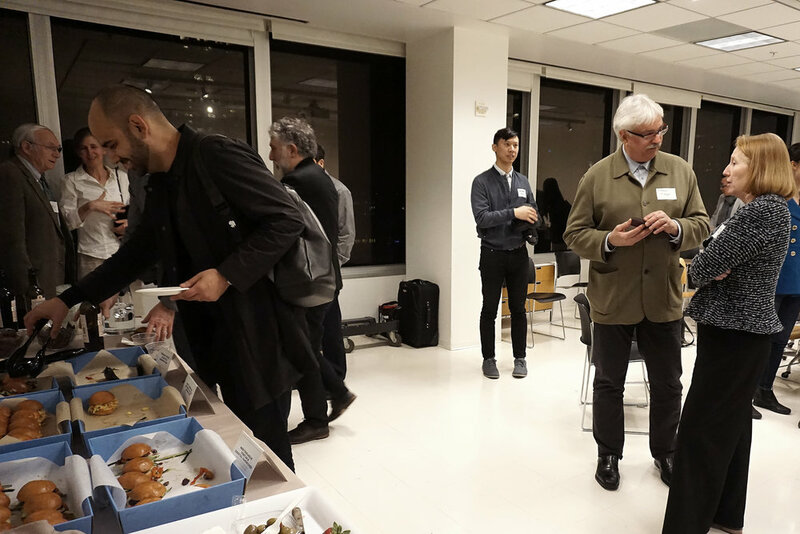 SA+P alumni, from the 1960s to recent graduates, were treated to an evening of conversation with Dean Sarkis at the San Francisco office of SOM where alumna Ellen Lou ’85 is Director of the Urban Design + Planning Group. Exuberant and engaging, Dean Sarkis brought alumni up to date on his vision for SA+P and shared his plans for strengthening the design core of the Institute while growing innovative programs that build on MIT’s creative and technical strengths; programs that will be enhanced by the collaborative space and state-of-the-art facilities proposed at the soon-to-be renovated Metropolitan Warehouse. Sensing the enthusiasm in the room, Dean Sarkis encouraged Bay Area alumni to re-engage with our alma mater by actively participating in current and future programs such as Design X and Urban Science, created with alumni participation in mind. Alumnus Jeffrey Heller ’64 ’67, FAIA, President and Founder of Heller Manus Architects, recently honored with the MIT Architecture Lifetime Achievement Award celebrating 150 years of MIT Architecture and the inaugural MITArchA Alumni Achievement Award, welcomed the invitation to go back to school, echoing the School’s youthful and innovative approach that has continued to renew and propel the nation’s oldest Architecture program to excellence. Jeffrey’s curiosity about the new Urban Science undergraduate major and how Bay Area alumni practices can learn from and support this new discipline as an active field laboratory underscores the mutually beneficial potential of stronger School + Alumni relationships. Dean Sarkis recognized, with great appreciation, Jeffrey Heller for his generous gift to the school, MIT’s first Architecture fellowship given by a practicing architect. This act of giving back is especially poignant at a time when the School of Architecture + Planning is at a historic and strategic crossroad. The promise of a physical nucleus to convene the brightest creative minds from the Institute to improve human interaction with the environment from the nano to cosmic scale bodes well for the future, a future that includes all of us. Curious? For two days in April - April 12 and 13, 2019 – Architecture 150 will be dedicated to welcoming SA+P alumni back to school to see and hear first-hand where we have been, where we are now, and where we are headed. Reserve your space now.